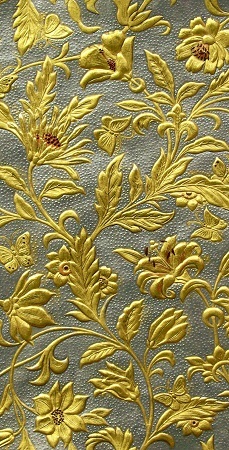 The Kinkarakawakami, the embossed Japanese wall paper, that flourished in the Meiji Period, has seen a dynamic success in its export to the United States and to Europe. Having myself engaged in the Kinkarakami Institute, I actively am involved in numerous restorations of the Kinkarakawakami in various places in Japan, while these always inspire me to learn more. It would be more than my great pleasure if I could revive this stunning exquisite art of Kinkarakami in our modern life and space.